Marshall Kilburn II is a fantastic update to its bestselling predecessor, with a stunning retro amp-inspired design and a well-rounded sound. While the bass can be a little muddy at times, it’s excellent for playing guitar music, and its portability means the Kilburn II is great for taking on the road. Marshall is known for its legendary guitar amps, but its foray into the world of speakers and headphones has seen its products migrate from the stage into our homes. Now, updating its bestselling Kilburn speaker, Marshall has released the Kilburn II, adding new features and functions and making it more roadworthy. Echoing the legacy of rock ‘n’ roll, Kilburn II has a solid metal grille that pays homage to the steel mesh grille found on many microphones and a guitar inspired carrying strap for easy portability. Its flush mounted corner caps and water-resistant design make it supremely rugged and durable. This stout-hearted hero is constructed with Blumlein Stereo Sound and is engineered to produce a larger than life multi-directional sound that will immerse you in your music, indoors or out. Powered by 36 Watts, its pronounced and articulate sound pushes the boundaries for a speaker of this size. 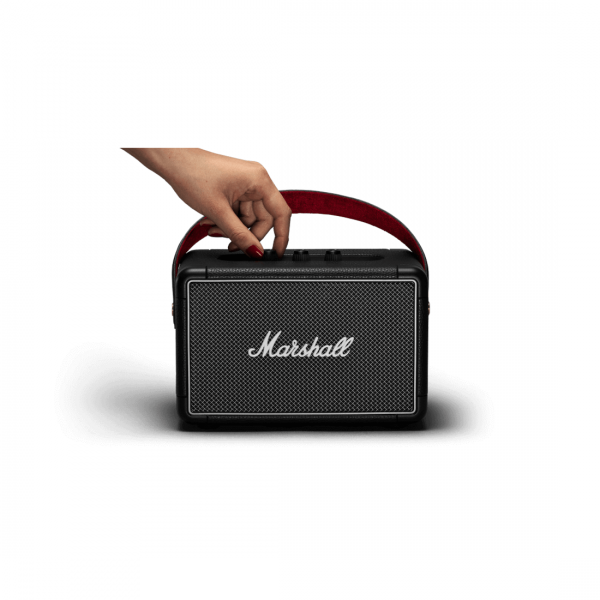 Marshall 1 Year Limited Warranty.